Gypsy Stash by Paula: Yummy Pumpkin Recipes. I spend reading and following blogs. I am proud to say that I have made some truly amazing friends online. her name is Sue with Country Pleasures. Each week on “Tasty Tuesday” Sue features a yummy homemade recipe. I love the recipes and I am sure that you will want to do some cooking with Sue’s weekly picks. Here is my favorite recipe from this month. This recipe is the next best thing to having Pumpkin Pie for breakfast with your coffee. Did I ever have pie for breakfast? Well I have had pie for breakfast, but only on a Holiday. Yummy. I love Pumpkin Pie. 1. Mix the eggs, milk, pumpkin puree, vanilla, cinnamon, ginger, cloves, nutmeg and brown sugar in low flat bowl for easy dipping. 2. Dip the bread into the egg mixture on both sides and grill in a pan until lightly golden brown, about 2-3 minute per side. 3. Serve with maple syrup. 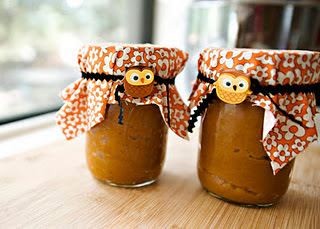 This week Sue has a super fun and easy Pumpkin Butter recipe posted. Country Pleasures and check it out. When you are visiting Sue’s blog be sure to scroll down to October 24th post. This post is a “Must See”. Sue and her hubby designed and built a incredible shabby potter shed from up-cycled material. I want one in my backyard. so handy for potting plants and gardening. and that you will become a new follower of her blog. We had a great time camping last weekend. I am sorry, I forgot to take photos to share with you. :(. We are heading back to Hunsader Farms this weekend. I will be sure to take some photos to share with you. Only a few days until the Drawing!!! 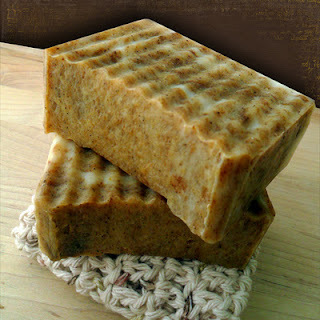 Win a “Fall Bundle” from Natural Garden Soaps. Pamper yourself at home with this handmade Fall Bundle. These goodies include the yummy fall scent of Pumpkin Pie. two bars of Smashed Pumpkin Pie Soap. To enter to win, simply leave a comment on this post or any post during the month of October. Drawing will be October 31st!!! 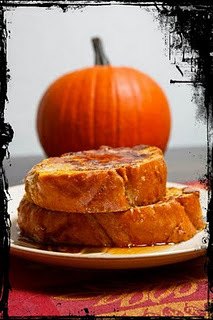 OMG that pumpkin french toast is making me hungry!!!! The Pumpkin Pie French Toast looks just so delicious. Thank you for the recipe. I want to win your soap!!! Thanks so much for the french toast I totally have to try it! I want to win your soap!!! Thanks so much for sharing your french toast I totally have to try it! I love food with pumpkin in it!!! Thanks for sharing. I love pumpkin. I'm stopping by from the Terrific Thursday hop and I'm following you by GFC. I'd love if you stopped by my blog too.